I am not a person who is into bath salts and all, but I thought of giving them a try. So , a while back I bought one from Soul flower, since I like their products. I am a huge fan of fresh aqua fragrances, so I went with what I thought would be such a fragrance. 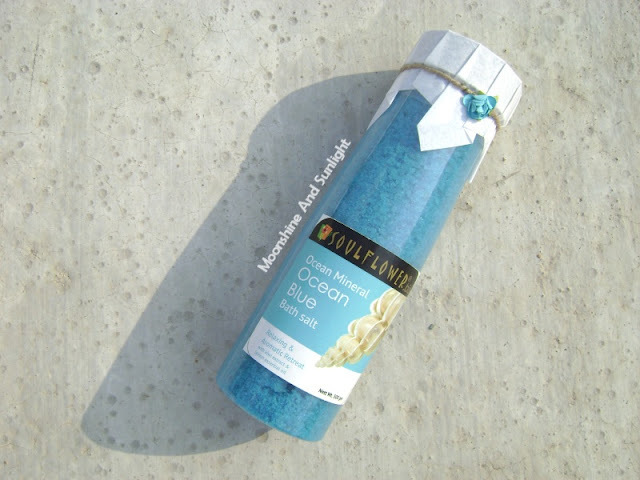 Soul flower Ocean Mineral Ocean blue bath salt is blue in color, but the fragrance is not a fresh aquatic type. It instead is a mild mix of citrusy and fruity fragrances. It does not have a very sharp citrusy note but a very mild one. I in fact like it, if not love it. For half a bucket of water I need almost two cups of this to get some fragrance. It takes around 5 minutes to dissolve in room temperature water and then you can take a bath with the water. I usually use this with lukewarm water. I usually use this at the end of my bath, so that the fragrance lingers longer. The fragrance stays for sometime only, say for 20 minutes before it fades off completely. I find it quite relaxing and I would request you to try out any bath salt you like, if you haven’t tried ever! Do you want me to try out DIY bath salt recipes (I have been thinking of doing that) and let you know how that goes?? Let me know in the comments! !